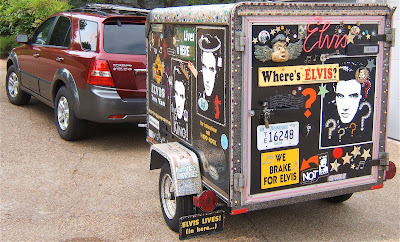 We've packed up the Elvismobile, our projects, the two dogs, plus sundry stuff ... that trailer is full ... and are heading north. 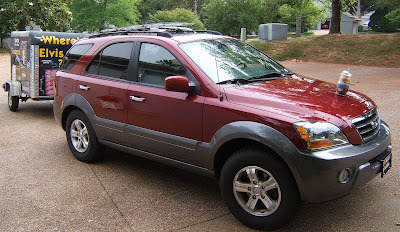 If you see us going, or coming, through your area between Tennessee and Michigan please wave. We don't really have a hood ornament. It's my husband's just finished project. 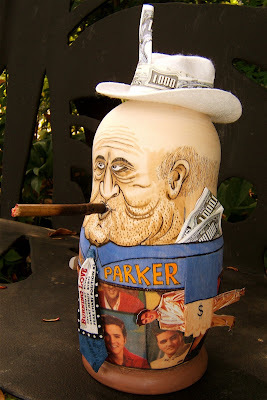 A while back he had made a set of Elvis stacking dolls (seen here). His latest fun is with Colonel Parker. I'll be back online next Monday. Hope you have a good weekend. 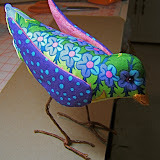 A few postings ago I wrote here about this piece that is a round robin between my friend, Jane, and me. To recap, she had given me the tree, I made an "ortwork" scene and gave it back to her. Jane finished it with the borders. 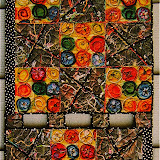 In this exchange I had given Jane one of the 6" blocks that I make out of my larger scraps. She scanned it into her computer and played. Jane ended up creating this fanciful creature in a field with some sky. I wish I had thought to take photos before it was finished. The silk flowers, yarn tail, plus the nose and wooden bead eye are my additions and of course there was no quilting when I got it. Hell On Wheels - 23"x24"
In addition to the added elements mentioned above, I increased the size by adding to the sky, a road in the foreground and stands of trees on each side. It appeared as though this creature was hellbent for somewhere so I stacked three sets of buttons to make wheels. I gave him a destination ... the last leaf left in the forest. I don't know what happened to the rest of them, but there was only one left and he was going to make sure it was his. It's contructed in my "ortwork" collage technique. My friend, Alicia, was visiting and making her ginkgo pieces when I was working on this. My intent had been to donate it to SMQ's small quilt sale. However, Alicia was tickled by the humor of this piece and my chatter while making it. So, it went home with her as an early birthday present. Now, I just need to remember when October rolls around that she already has her gift. Some of you may consider that I've saved the best quilts for last. 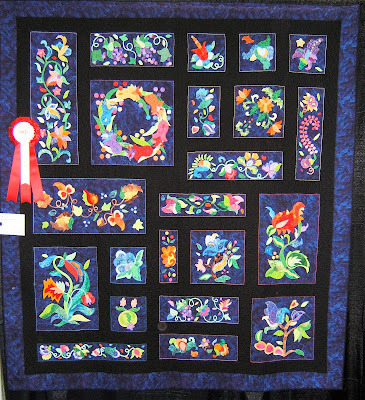 These are some of the more traditional patterned bed quilt entries. "Wreath and Star" by Fay and Merl Pritts of Mt. 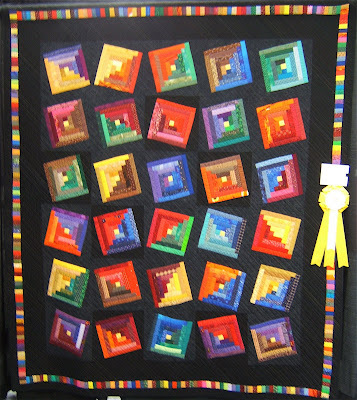 Pleasant, Pennsylvania awarded 1st Place in the Two Person Team Quilt category. This husband and wife team also received the Traditional Design ribbon for this beautifully appliqued and hand quilted piece that is a pattern from the Women's Day Book of American Needlework, 1963 edition. 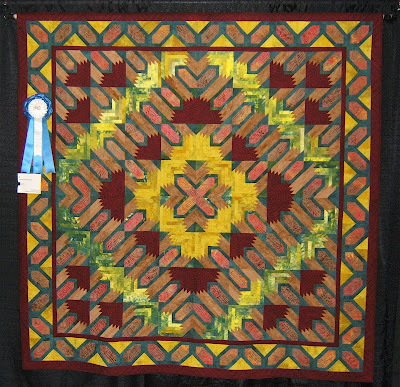 "The Anniversary Quilt" by Margo J. Clabo of Cleveland, Tennessee received an Honorable Mention in the Two Person Team category. 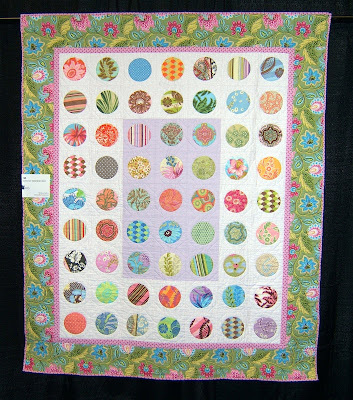 She needle-turn appliqued and personalized the design from "Garden City Gateworks" by Dinah Jeffries. 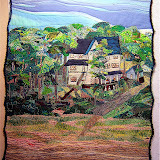 Kathy Drew of Knoxville machine quilted it. "Thanks Suzanne" by Nancy Hahn of St. Peters, Missouri awarded 2nd Place in the Bed Quilts-Mixed Techniques/Applique category. 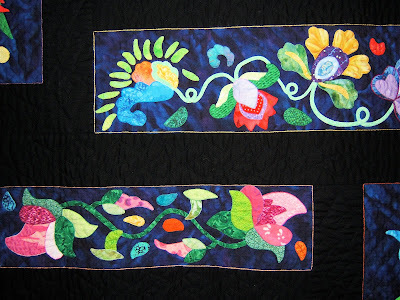 Suzanne Marshall's beautiful work and words of encouragement were her encouragement for the hand-applique, embroidery, and hand quilting. Patterns (some modified) are from Jacobean Rhapsodies by Patricia Campbell and Mimi Ayars. 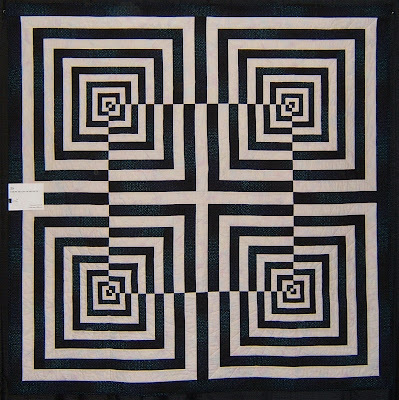 "Finding Unity" by Jan Wass of Vonore, Tennessee in the Group Quilt category. 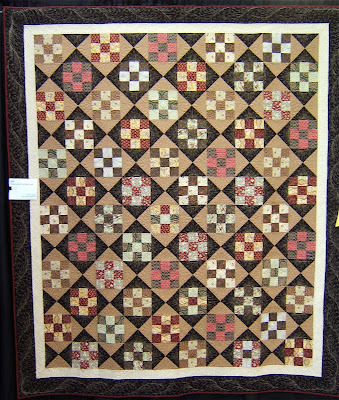 The blocks were won in a guild challenge and it was machine quilted by Kathy Drew of Knoxville, Tennessee. "Diamond Feathers" by Darlene Bakos of Maryville, Tennessee in the Two Person Team category. The combination of the 9-patch and Hourglass blocks makes it appear to be made on point. 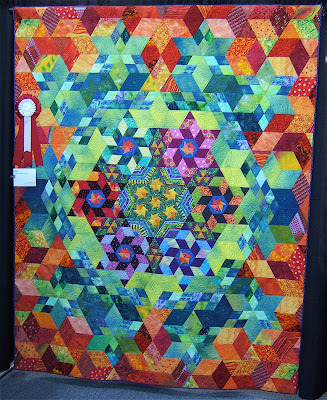 It is machine quilted by Debbie McMurray. 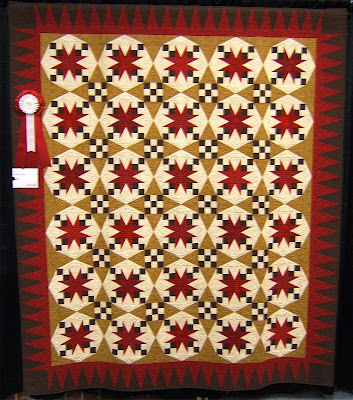 "Gilded Stars" by Loretta Painter of Norris, Tennessee awarded 2nd Place in the Bed Quilt/Pieced and Appliqued category. 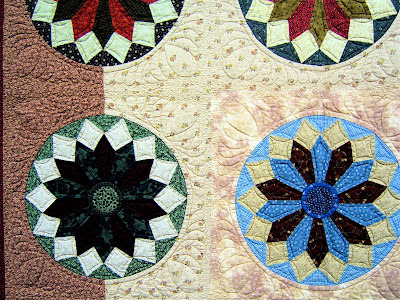 The center is a contemporary nine-patch she saw in American Patchwork and Quilting magazine. 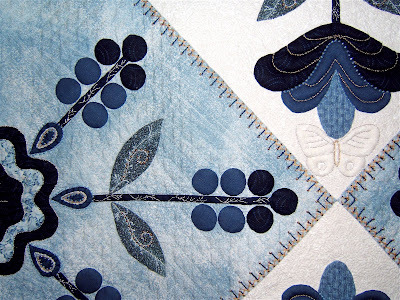 Loretta designed the border using EQ5. 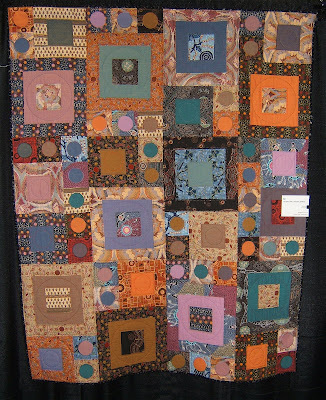 "The Tie Collection" by Debbie Cooper of Knoxville, Tennessee in Bed Quilts-Mixed Techniques/Applique category. 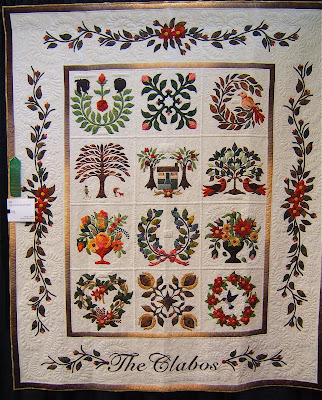 This quilt was commissioned by a widow. It is made from her husband's neckties and home decorator fabrics. 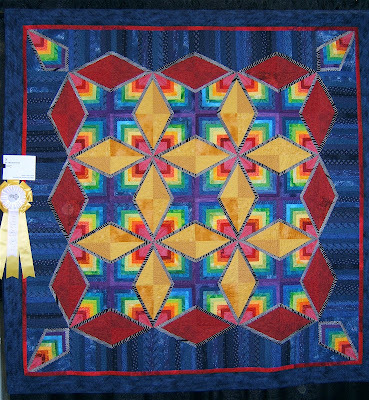 "Sunburst" by Fran Kordek of Elkins, West Virgina received an Honorable Mention ribbon in the Bed Quilts/Pieced category. 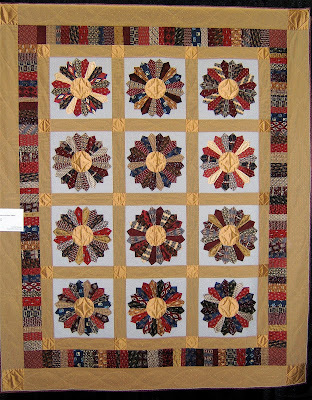 It was inspired by a quilt documented at the Pearl S. Buck birthplace in Hillsboro, West Virginia. 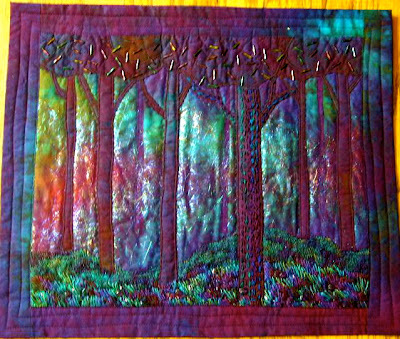 "Midnight Blue" by Whilhelmina Vandevoorde of Sevierville, Tennessee in the Bed Quilts-Mixed Techniques/Applique category. 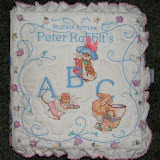 It is hand appliqued, hand quilted, embroidered and beaded. There is also trapunto. The pattern is Irma Gail Hatcher's "Hot Fudge Sundae". 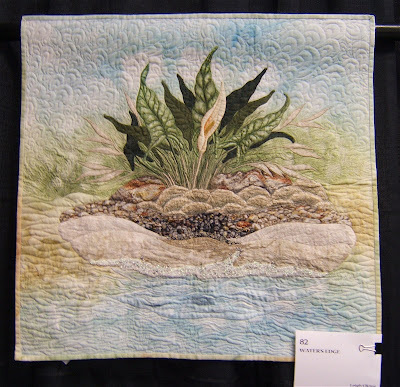 I've enjoyed sharing some of the wonderful quilt entries from all over the country that are typical in this show. If you are within driving distance of Knoxville, please plan to come see the show in person next year. 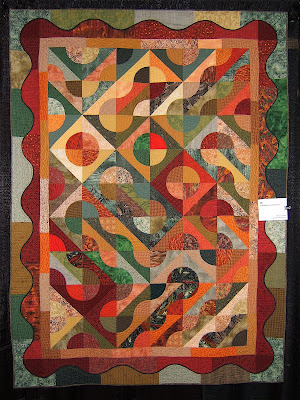 If you've never entered the Smoky Mountain Quilt Guild Show, please consider doing so. I'll be making the special award ribbons again. 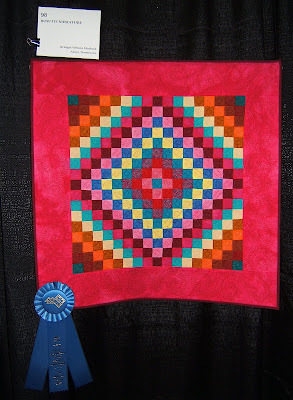 To view slides of all the ribbon winning quilts go the SMQ Guild website (click and be taken directly to the web page). 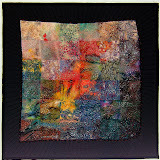 "Nowhere To Hide" by Beverly Hertler of Red Bank, New Jersey awarded 1st Place in the Small Art Quilt category. She hand-stamped and painted silk and commercial mud cloth. 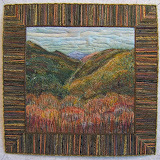 "Autumn Rhapsody" by Leigh Elking of Scottsdale, Arizona awarded 3rd Place in the Miniature quilt category. 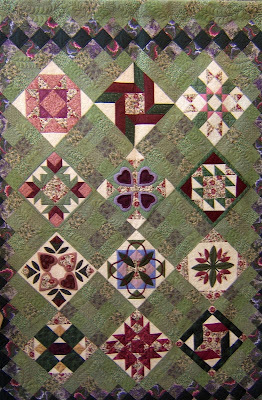 A small quilt she designed that appears in Ricky Tim's "Rhapsody" quilt book. 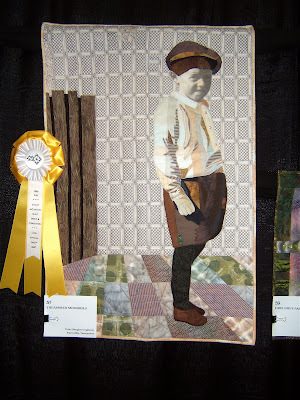 "Bow Tie Miniature" by Bridget Wilson Matlock of Alcoa, Tennessee awarded 1st Place in the Miniature Quilt category. There are tiny folded bow ties set in a Trip Around the World style. 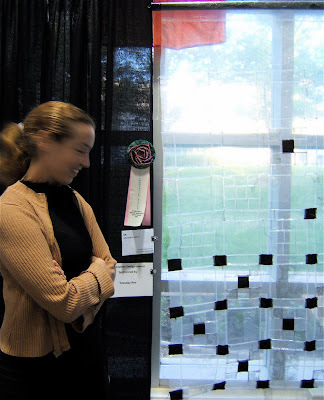 "Memory Quilt" by Avigail Manneberg of Knoxville, Tennessee received the the Innovative Design Award. 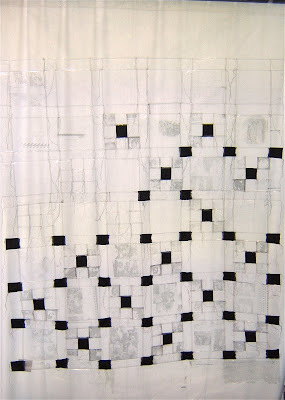 The quilt tells the story of her mother's and grandmother's immigration from the United States to Israel. Three generations are represented by three levels of transparency. I had the pleasure of meeting Miss Manneberg at the award reception. This was the first exhibition of her amazing art piece. That first evening it wasn't realized that a white drape needed to be hung behind it to optimize the visibility of the the photos printed on the clear material . 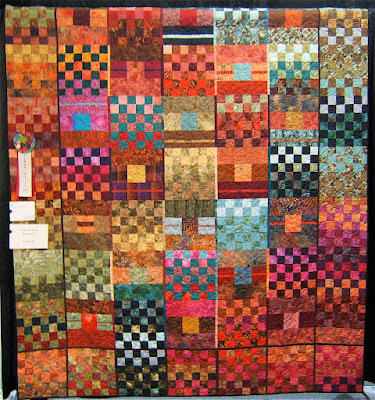 For your enjoyment, here are few wall quilts from the show. 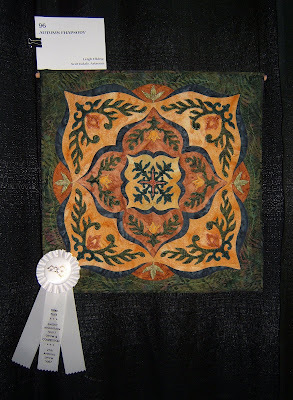 "Starcrossed" by Dixie Haywood of Pendleton, South Carolina awarded 3rd Place in the Wall Quilt-Pieced and Quilted category. 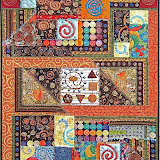 "Autumn's Confetti" by Margo J. Clabo of Cleveland, Tennessee in the Wall Quilts- Pieced category. 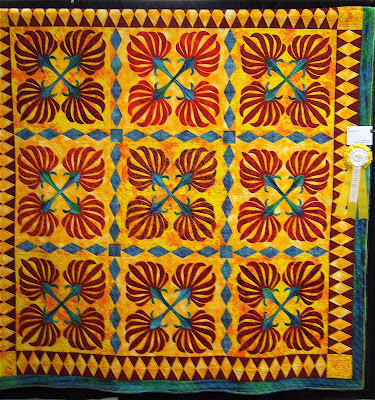 The pattern is by Mary Mashuta. 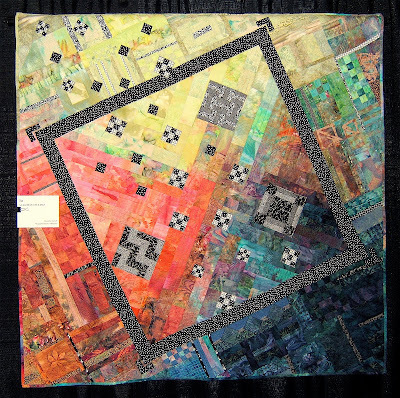 "Cherchez Le Diamante" by Donna J. Cook of Chicago, Illinois in the Wall Quilts-Pieced category. This original design was inspired by Japanese optical and geometrical art of Hajime Ouchi. 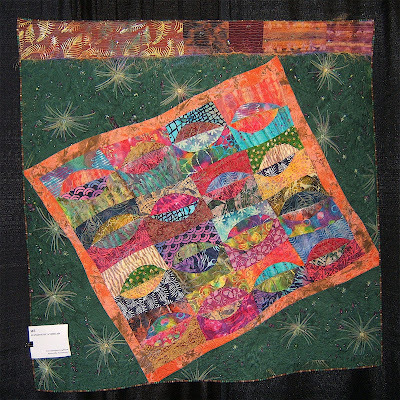 "Hanging By A Thread" by Tone Haugen-Cogburn of Maryville, Tennessee in the Large Art Quilt category. 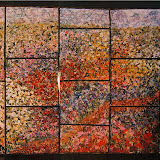 It is constructed in Tone's own random curve piecing technique. 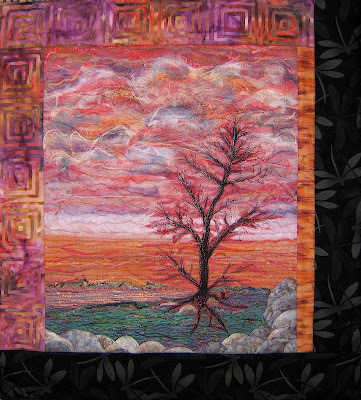 "Slightly On Edge" by Sherrie Grob of Murphysboro, Illinois in the Large Art Quilt category. 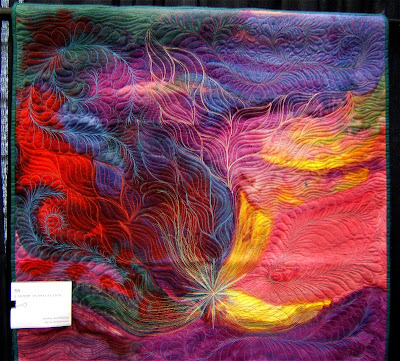 "Heat Waves VII: Hot Springs" by Lynne G. Harrill of Greenville, South Carolina awarded 3rd Place in the Large Art Quilt category. 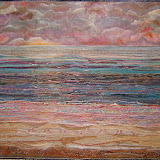 "Caribbean Reflection" by Debbie McMurray of Alcoa, Tennessee in the Small Art Quilt category. 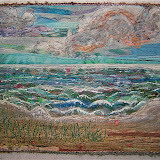 She hand dyed silk and machine quilted patterns depicting the underwater landscape. 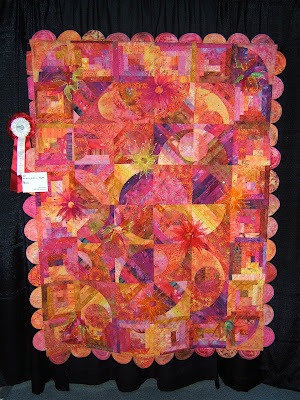 "Peach Sherbet" by Judi Hoffman of Knoxville, Tennessee awarded 2nd Place in the Large Art Quilt category. She used techniques from Strips'n Curves. 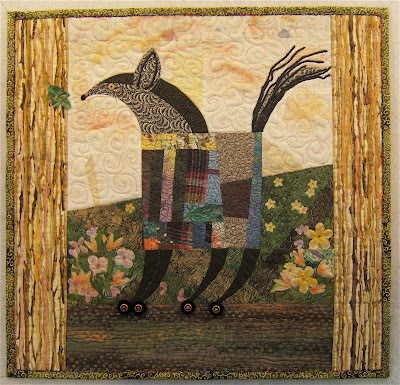 "Wheels Through Time" by Melissa Carter of Knoxville, Tennessee hand appliqued and hand quilted wall quilt. Melissa applied a few crystals in the border flowers. 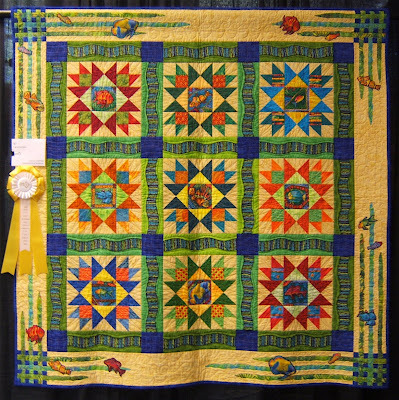 "Fiesta Fish" by Linda Griffiths of Elizabethtown, Kentucky awarded 3rd Place in Wall Quilts- Mixed Techniques category. 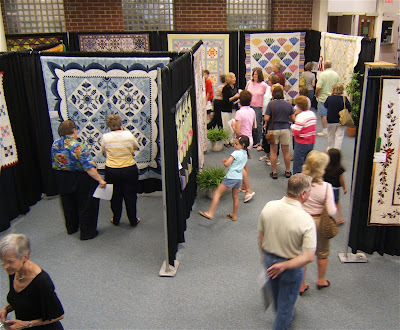 There were over 2200 visitors to this three day show of over 140 quilts. 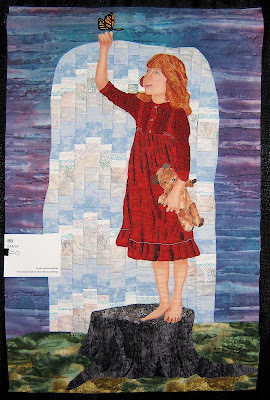 In previous posts I've showcased some of the pictorial wall quilts. While I have great appreciation for traditional-based bed quilts, my preference is for the bright contemporary ones. Here are a few that appealed to me. 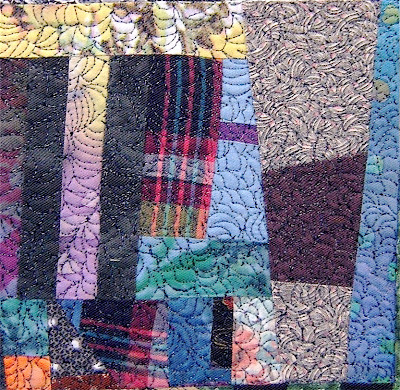 "Fractured Moonlight" by Alexandra Schweitzer of Crystal Lake, Illinois awarded 3rd Place in Bed Quilt-Pieced & Quilted category. 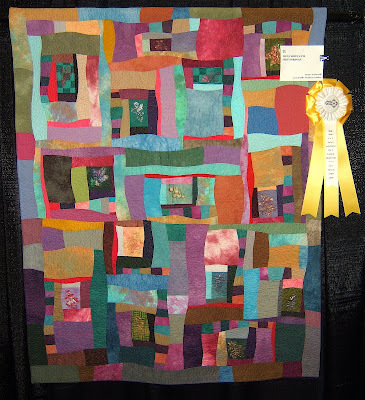 "Twist And Shout" by the Out of Towners from Knoxville, Tennessee awarded 2nd Place in the Group Quilt category. The group is four members of our guild. 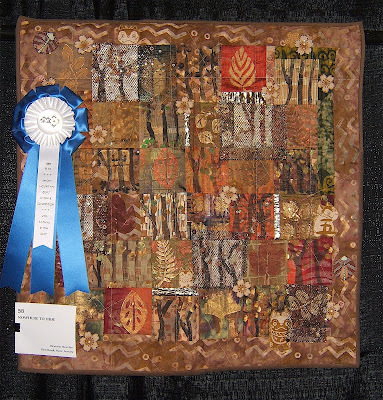 "Autumn Pleasures" by Mozelle Morgan of Loudon, Tennessee received the Scrap Quilt award. It's pieced and quilted by machine. 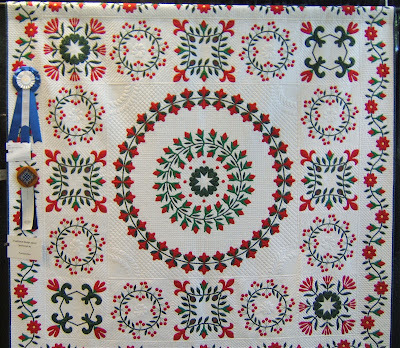 "Hot Cotton" by Dixie Haywood of Pendleton, South Carolina awarded 3rd Place in Bed Quilt-Appliqued & Quilted category. 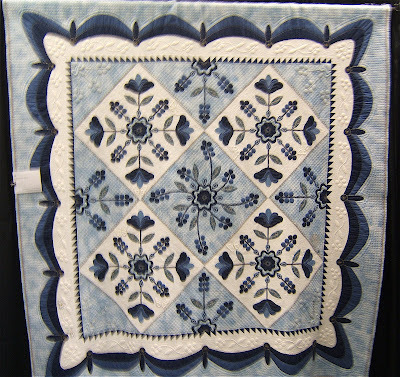 "Swedish Storm" by Dixie Haywood of Pendleton, South Carolina awarded 1st Place in the Bed Quilt - Pieced & Quilted category. 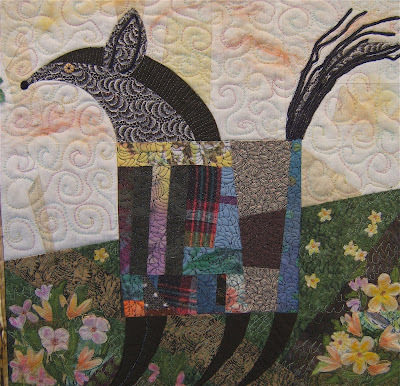 "Seth's Dreaming Quilt" by Melissa Carter of Knoxville, Tennessee is machine appliqued and hand quilted using her favorite collection of Australian fabrics. 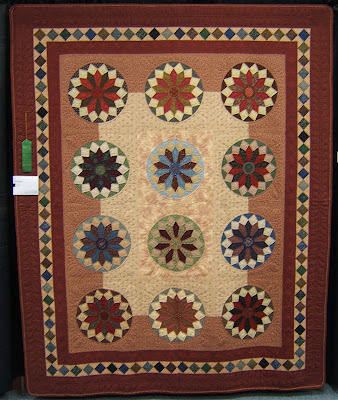 Here are the pictorial quilts that I took photos of at the Smoky Mountain Quilt Guild Show this past weekend. 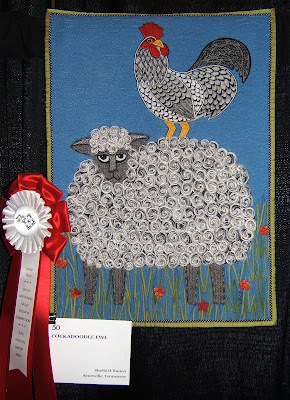 "Cockadoodle Ewe" by Sheila Rauen of Knoxville was awarded 2nd Place in Wall Quilts Mixed Techniques. 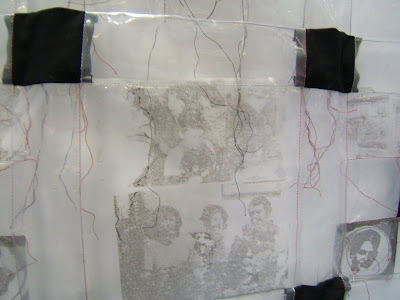 Sheila works with wool and silk fabrics. She needle punches design elements in her compositions. 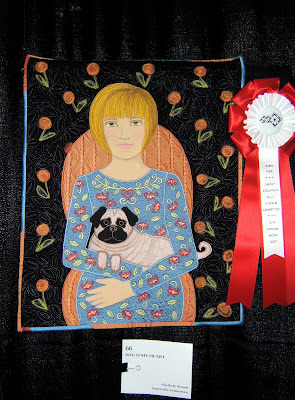 "Pug O My Heart" by Sheila Rauen of Knoxville awarded 2nd Place in Small Art Category. She also hand paints design elements. "Emily" by Jean Loussarian of Westminister, South Carolina entered into the Pictorial Category. There are about 80 pieces of fabric in the dress. "Treasured Memories" by Tone Haugen-Cogburn of Maryville, Tennessee was awarded 2nd Place in the Small Art Category. Features a snapshot of her father when he was a boy. 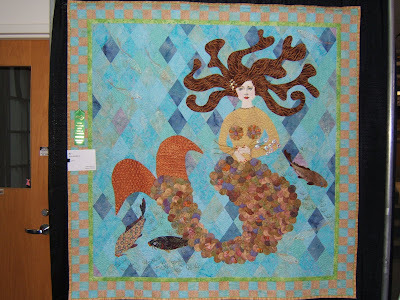 "Sea Maiden" by Pat Kumicich of Naples, Florida awarded an Honorable Mention in the Pictorial Category. "Geisha" by Jan Was of Venore, Tennessee entered in the Pictorial Category. 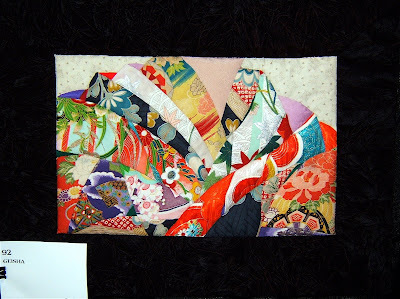 By appliqueing Japanese silk and cottons, attention is focused on the layers of kimonos on the shoulders of the geisha. "The Woods Are Lovely, Dark, and Deep" by Sherrie Groman of Columbus, Mississippi entered in the Pictorial Category. This view was inspired from a window. "Water's Edge" by Leigh Elking of Scottsdale, Arizona entered in the Pictorial Category. 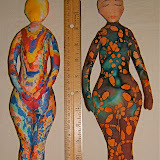 She used hand-painted and commercial fabrics. It's embellished with specialty fabrics, threads, and beads. There are more photos to come in the next couple of postings.